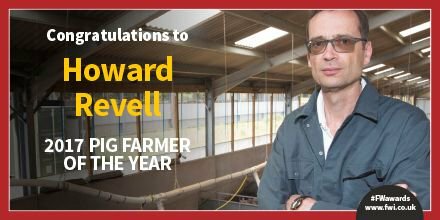 British Quality Pigs' (BQP) Howard Revell has been crowned Pig Farmer of the Year of the 2017 Farmers Weekly Awards. Howard, BQP's production manager, was unveiled as the winner at a prestigious ceremony in London, hosted by Gyles Brandreth on Thursday night. He came out top from a high quality list of finalists that also included Guy King, of Park House, in Norfolk, and Stephen and Karen Thompson, of Povey Farm, in Yorkshire. Suffolk-based BQP-Dalehead, which is owned by Tulip, is one of the country's biggest pig producers. Supplying Waitrose it is responsible for 10% of the UK sow herd population, operating efficient, high-welfare outdoor systems. The judges praised BQP's culture, epitomised by its continuous innovation, high welfare and ethical production, customer focus and strong environmental attributes. All the pigs are managed by contract farmers, but BQP has a firm handle on technical performance on each of its farms, the award write-up pointed out. "It uses software to analyse performance figures, while field officers help farmers better their key performance indicators. BQP works closely with genetics companies to enhance the performance of sows and even conducts research on one of its units. "Innovative troughs for feeding sows reduce wastage and environmental issues and buildings for growing pigs optimise their welfare. "The business is actively involved in helping find solutions to industry problems such as antibiotics use. Investing more than a million pounds to install select dosers on every contract grower-finisher farm is part of the initiative to reduce medicine use. "It works closely with its main customer Waitrose and is passionate about educating consumers by promoting pig production at farm events." NPA chief executive Zoe Davies, who attended the awards, congratulated Howard and the rest of the finalists in the pig category. She said: "Congratulations to Howard for a throughly deserved win and well done to the other finalists. You've all made the pig industry proud!"